Egg Roll! Egg Roll!! Egg Roll!!! Buy your Egg Roll! If you have ever travelled to Lagos from Eastern Nigeria by road, this is one of the things you'll hear being shouted by hawkers somewhere from Ore. I can't remember from where exactly you start hearing these calls from the hawkers but I know that this is my favorite thing to hear whenever I'm travelling to Lagos by road. 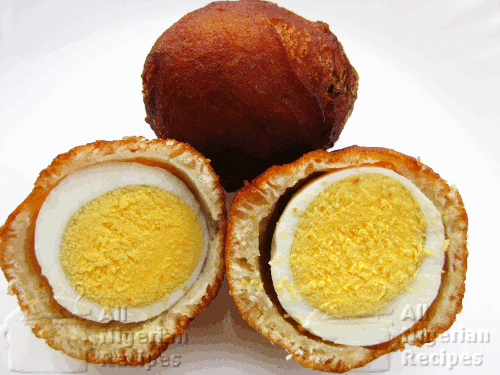 I love those perfectly oval Nigerian Egg Rolls and I've always wondered how they can make such a snack with the Puff Puff pastry perfectly covering the eggs. So on this page, you'll find my attempt to try and replicate that delicious snack. At first, I tried to make this snack using Puff Puff batter but failed woefully because the batter was too watery for egg rolls, the eggs did not pick up enough batter so I ended up with egg rolls with very thin puff puff pastry on the outside. In some cases, the egg was not fully covered and there were lots of the pastry sticking out here and there during frying. I concluded that the egg rolls must be made from dough so I tried again using a sticky dough that I can easily manipulate with my hands. The result is what you'll see in the video below but I strongly believe that the commercial egg roll makers must have a special machine for wrapping the dough on the eggs. That's the only way they can mass-produce the enormous quantity of egg rolls that are being sold on the Lagos/Benin expressway … lol. This is only my attempt to make the Nigerian Egg Roll so follow this recipe at your own risk 🙂 I say at your own risk because I found that getting the insides to be well done is a hit/miss affair for me. Also, I guess there's an easier way to make these on a large scale or commercially. So for those of you who use my recipes for business, make sure you learn how to make egg rolls from an expert before attempting to supply these for money. Do mix the dough with lukewarm water. If your yeast is not as powdered as mine (see video), mix it separately with lukewarm water before adding it to the rest of the ingredients. Heat up the oil at any temperature but reduce the heat to low before frying the egg rolls. I found that the outsides brown too quickly and if the oil is too hot, the insides of your egg roll will not be well done by the time the outside is brown or even burnt. You only need to wrap the egg with a thin dough. If you want to make the dough thick so that the egg rolls will be as big as the ones sold in Nigeria, the insides will not be done by the time the outside starts burning. I tried everything possible, fried it with very low heat to no avail so there must be a secret to how the Nigerian ones are made. I'm still looking into that. But don't worry too much about the thickness, the taste is the same. Serve with a chilled drink. Watch the video below to see how I made my Nigerian Egg Rolls.